Published in cooperation with the Radiological and Medical Physics Society of New York (RAMPS). Intended for residents in diagnostic radiology and radiation oncology to use as a practice exam or for self study. 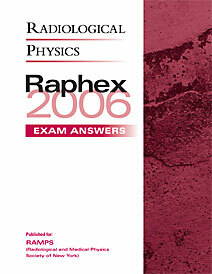 RAPHEX contains three sections: General, Diagnostic, and Therapy. A separate answer booklet is provided which gives short explanations of why each answer is correct, along with worked calculations when appropriate.